I like fruit, I like white teas, but a fruity white tea? Mango Madness came recommended to me by someone who worked at the DavidsTea that I so frequently frequent. It smelled amazing in store – very much like a ripen mango. The dry tea smells like mangoes, apples, and flowers. I cannot for the life of me actually smell the white tea base, but it’s supposedly there. Mango Madness is made up of: apples, white tea, pineapple, orange, safflower, strawberry, calendula petals, mango, stevia extract, and natural mango flavouring. Mango Madness contains sulfites (sulphites) for anyone who’s sensitive to them. 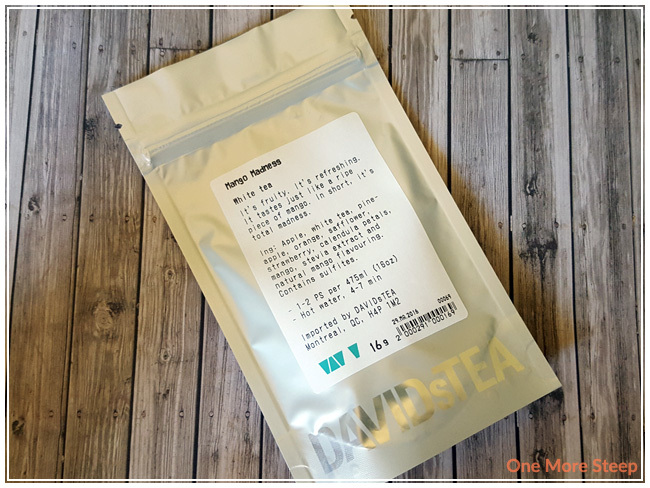 Mango Madness isn’t the nicest looking tea that I’ve reviewed before here on One More Steep, but it certainly has a heavy fruit to tea ratio. DavidsTea recommends steeping Mango Madness in hot water for 4-7 minutes. Their website indicates that “hot water” is 75-80°C (167-176°F). 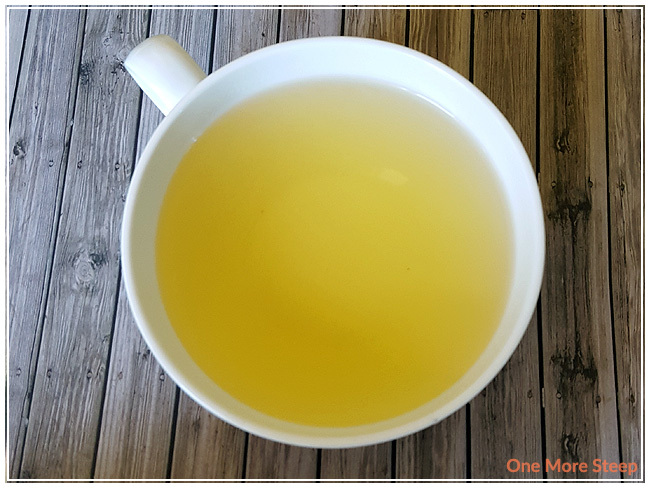 The base of Mango Madness is a white tea, so you want to make sure that your water isn’t too hot or else you risk burning the leaves. I steeped my pot of Mango Madness for about 4 minutes for the first steep. Mango Madness steeps to a bright yellow that reminds me a lot of the colour of the inside of a ripe mango. This tea lives up to its name as it does smell like mango! The taste of Mango Madness is undeniably fruity. It has a sweetness to it that doesn’t require additional sweetener at all, in my opinion. I can taste the mango and pineapple, along with some subtle floral notes that are a bit difficult to pick out at times. The stevia/sweetener distracts from the natural floral notes in this tea blend. I attempted to resteep Mango Madness, it was quite watery and didn’t make nearly as much of a punch as the first steeping of Mango Madness. I would say that Mango Madness is only good for one steep. I loved DavidsTea’s Mango Madness. It’s delicious and lives up to the promise in its name – heavy mango flavour that doesn’t require anything extra. I tried icing the rest of the tea that I had in my pot and it does very well as an iced tea, I would say it would be good as a tea pop (tea mixed with soda water) or just on its own cold. 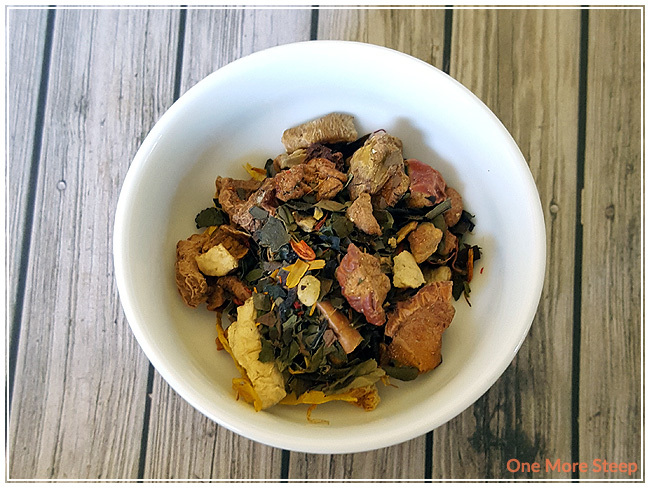 It is quite expensive for a tea that doesn’t do well for being steeped more than once, so do take that into consideration – there are other teas that are less expensive that do equally well when iced. However, if you’re looking for a mango iced tea, Mango Madness will fit the bill!